Healthy Food and Drinks Substitutes - Gym Training App by Weightplan.com - Gym Training Personal Trainer App - Free Diet & Exercise Tracker, Personal Trainer, workout plans, build muscle, gain fitness and burn calories. ​Fats and oils have had a bad press for many years but most of us simply can’t live without them. Selecting which oils and fats to use in everyday cooking can get confusing. Whether you’re frying, drizzling on a salad, or adding to cookie-dough, what do you need to be aware of, which are the worst offending fats and are there healthier options available? Many of us slather olive oil over our food without considering the calories, but at 45 calories per teaspoon, just how many calories does your healthy salad now contain? 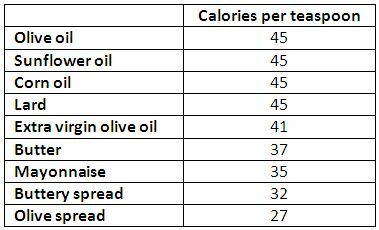 Take a look at the table below to compare the calories in our favourite oils and fats. Found in many cheeses, cream, milk, meat fats, lard, coconut oil and chocolate. Saturated fats are linked to an increase in cardiovascular disease and cancer and are typically higher in calories when compared with unsaturated fats. You should try to limit the amount of saturated fat you consume. Found in foods such as nuts, avocados and olive oil, monounsaturated fat is linked to a reduction in cholesterol and healthier for you than saturated fat. Lower in calories than saturated fat, unsaturated fats are seen to be healthier, although they are often found alongside saturated fat. Found in fish, nuts and seaweed, omega-3 fatty acids are linked to lowering the risk of heart attacks and reducing certain cancers while omega-6 is linked to reducing cardiovascular disease. The top 5 polyunsaturated rich foods are walnuts, sunflower seeds, sesame seeds, peanuts and seaweed – but don’t be tempted to eat too many, they’re still highly calorific. These are unsaturated oils that have been hydrogenated and were once commonly used in margarine enabling it to set at room temperature like butter. Trans-fats have been linked to similar increased levels of bad cholesterol (LDL) to those of saturated fats, and like saturated fats are linked to heart disease. Trans-fats are also known to be detrimental to our levels of good cholesterol (HDL) which meant that they are actually less healthy than the saturated fats they were designed to replace. This finding shook up the whole margarine industry in the mid 1990’s. Today, most margarines and buttery blends contain little or no trans-fat, but it’s still worth checking the packet. With most cooking sprays containing less than 1 calorie per spray, they are definitely worth considering if you are on a low calorie diet or trying to reduce fat in your diet. They are used to replace regular, higher calorie oils and have been designed for shallow frying, roasting and baking by helping to stop your food from sticking to your cooking equipment. One word of warning however, if you use non-stick pans you could be wasting your money as residue can build up on the non-stick coating. Reduce your daily fat consumption to below 30% of your total daily calories. Try to eliminate trans-fats completely from your diet and replace saturated fats with healthier monounsaturated and polyunsaturated fats. Oils and fats have high calorie contents. Always measure the amounts you use carefully. If you have an oil pourer, pour your oil into a teaspoon first, as without measuring you are likely to add more than you need. Measure your butter and margarine rather than just spreading straight from the packet; you’ll soon get used to having a thinner spread instead. Use non-stick pans and cookware in preference to regular pans. Non-stick pans require much less oil than regular pans and, if you’re cooking something with a high fat content, try cooking without oil. You can save calories when baking by using greaseproof paper instead of oils and fats. Its also so much easier to release your baking and much easier to clean you cookware. Dressings and mayonnaise are usually oil based so look for the low calorie options. In general, if a food tastes rich and melts in the mouth, it’s probably going to contain fats or oils. We all know they taste good, but try to limit the amounts of these foods and stay within the recommended daily guidelines for total fat and saturated fats. Watch the daily calories too (around 2000 calories for women and 2200 calories for the average man). Simply put, if you know you’ve overindulged one day, try to make up for it the next to restore the balance. For help with a healthy eating plan join Weightplan.com today.